335 people joined the online workshop. 57% of our public sector workforce participants have a completely or partial frontline role (the largest source of contributions to the conversation came from the Pennine Acute Hospitals NHS Trust). 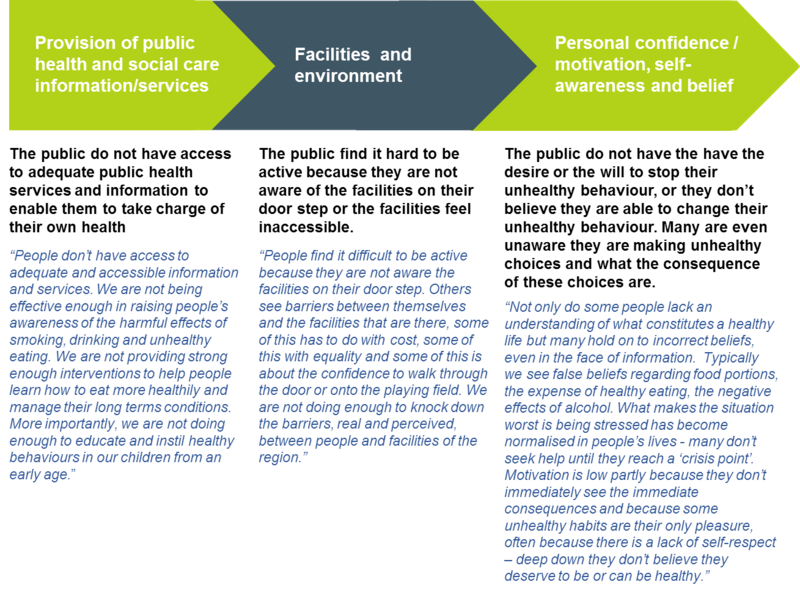 As we saw in the exploration of the six typologies, the public recognised confidence and perception issues as a key barrier to taking charge of their health. And whilst the public sector workforce recognise this too, they place much of the blame for our failure to improve public health on public information and services, with some emphasis on local parks and leisure facilities and the environment. The three core themes of their discussion can be defined as follows (once again, a typical narrative emerged when analysing the ideas, comment and votes that the public sector workforce had shared in relation to each topic). It’s worth noting that shouldering this burden is causing the public sector workforce some stress. What might help the people of Greater Manchester to take charge of their health? Setting up projects in the local community to educate and engage people around healthy but low cost cooking. parkruns are a wonderful asset and run themselves at no cost to the LA, in fact many of them have parkrunners who help with friends of parks groups on paths maintenance etc. They cost £3k to set up which is match funded by the national parkrun organisation and they help them get set up and provide the infrastructure and equipment. Then they run themselves. More courses available to help people living with a long term condition as having been on an expert patients course in bury I could not believe the difference it made to the group of people I was with. It enable us all to be with people who understood us and it helped us to make changes and take back control of our lives. Launch an intergenerational physical exercise programme which provides training for young people in Key Stage 4 to run Move More and Keep Fit physical exercise classes for Older people in the community. In other parts of the country this has worked successfully on the premise that older people buy into because they are sold the concept that they are up skilling young people and building their confidence and young people buy into it because they are sold the concept that they are gaining marketable skills by helping frail elderly people to stay fit.